Manufacturer’s Suggested Retail Price. Excludes options; taxes; title; registration; delivery, processing and handling fee; dealer charges. Dealer sets actual selling price. While great effort is made to ensure the accuracy of the information on this site, errors do occur so please verify information with a customer service rep. This is easily done by calling us at (866) 759-7009 or by visiting us at the dealership. No security deposit with approved credit. Expires 4/30/19. 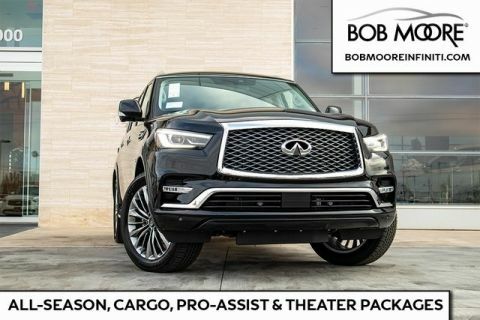 This vehicle is equipped with: 22" Wheel Package (Wheels: 22" x 8.0" 14-Spoke Forged Aluminum-Alloy), All-Season Package (All-Season Floor Mats and Cargo Area Mat), Cargo Package (First-Aid Kit, High-Density Non-Slip Rear Cargo Carpet, and Nylon-Cord Cargo Net), ProASSIST Package (Backup Collision Intervention (BCI), Blind Spot Intervention (BSI), Blind Spot Warning, and Intelligent Cruise Control (Full-Speed Range)), 13 Speakers, 2.94 Axle Ratio, 3rd row seats: split-bench, 4-Wheel Disc Brakes, ABS brakes, Air Conditioning, AM/FM radio: SiriusXM, Anti-whiplash front head restraints, Auto High-beam Headlights, Auto tilt-away steering wheel, Auto-dimming door mirrors, Auto-dimming Rear-View mirror, Auto-leveling suspension, Automatic temperature control, Brake assist, Bumpers: body-color, CD player, Delay-off headlights, Driver door bin, Driver vanity mirror, Dual front impact airbags, Dual front side impact airbags, DVD-Audio, Electronic Stability Control, Emergency communication system: INFINITI Connection, Four wheel independent suspension, Front anti-roll bar, Front Bucket Seats, Front Center Armrest, Front dual zone A/C, Front fog lights, Front reading lights, Fully automatic headlights, Garage door transmitter: HomeLink, Genuine wood console insert, Genuine wood dashboard insert, Genuine wood door panel insert, Heated door mirrors, Heated Front Bucket Seats, Heated front seats, Heated steering wheel, Illuminated entry, INFINITI Radiant Welcome Lighting, Leather Shift Knob, Leather steering wheel, Leather-Appointed Seats w/Stratford Burl Trim, Literature Kit, Low tire pressure warning, Memory seat, Navigation system: INFINITI InTouch Navigation, Occupant sensing airbag, Outside temperature display, Overhead airbag, Overhead console, Panic alarm, Passenger door bin, Passenger vanity mirror, Power door mirrors, Power driver seat, Power Liftgate, Power moonroof, Power passenger seat, Power steering, Power windows, Radiant Illuminated Kick Plates, Radio data system, Radio: AM/FM/HD w/Single In-Dash CD/DVD Player & MP3, Rain sensing wipers, Rear air conditioning, Rear anti-roll bar, Rear audio controls, Rear reading lights, Rear seat center armrest, Rear window defroster, Rear window wiper, Reclining 3rd row seat, Remote keyless entry, Roof rack: rails only, Roof Rail Cross Bars, Security system, Speed control, Speed-sensing steering, Split folding rear seat, Spoiler, Steering wheel memory, Steering wheel mounted audio controls, Tachometer, Telescoping steering wheel, Tilt steering wheel, Traction control, Trip computer, Turn signal indicator mirrors, Variably intermittent wipers, Voltmeter, and Wheels: 20" x 8.0" Aluminum-Alloy. 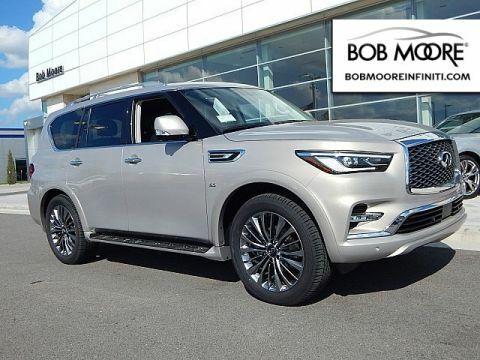 Bob Moore INFINITI in Oklahoma City offers an impressive selection of new, used and certified pre-owned vehicles. Our dealership not only has crossovers like the QX50 and QX70, but also coupes and convertibles. 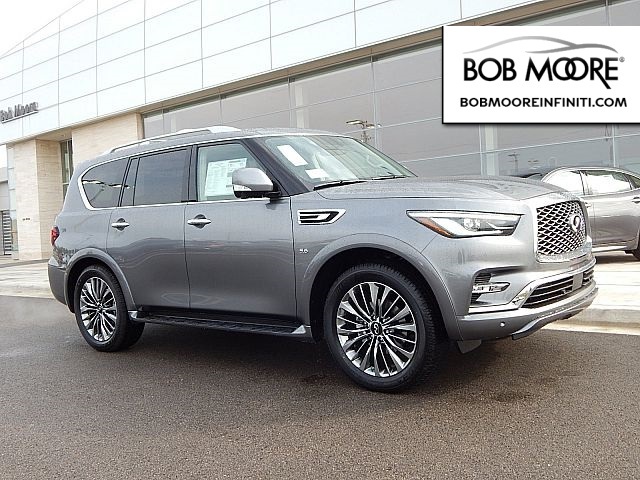 In addition to the amazing vehicles, we have an enthusiastic staff which is willing to go above and beyond to make sure the customers are satisfied. 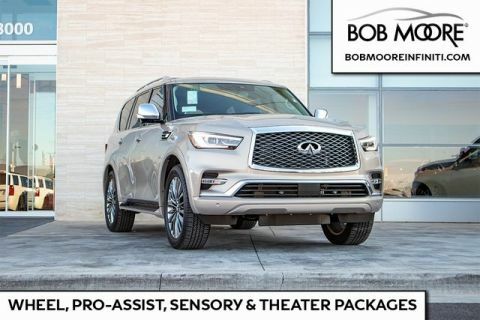 Feel free to call us, your Norman INFINITI dealer alternative, at 405-237-5483, or email us with any questions you may have! We would also like to be your Shawnee INFINITI source. 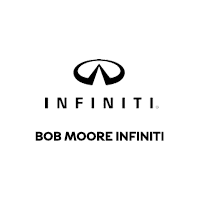 Bob Moore INFINITI	35.6007366, -97.4941859.